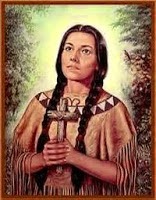 Kateri Tekawitha was a Native American who converted to Catholicism. She born in town of Auriesville, New York in 1656. Tekawith was the daughter of a Mohawk Warrior and was known as the "Lily of the Mohawks." At a young age she contracted small pox which left her extremely scarred and nearly blind. She was baptized Catholic when she was 20. After her conversion, she faced many hardships including harsh treatment from her tribe. She spent her life in prayer, penance and caring for the sick in Canada. Nothing would stop her from doing these things, not even the harsh northern winters where she would wait in the cold for Mass until the chapel opened. She died at age 24 and was declared venerable in 1943 and later beatified by Saint John Paul II in 1980. Her feast day is on July 14. Tekawitha is now the first Native American saint in the Catholic Church. She was canonized by Pope Emeritus Benedict XVI on October 21, 2012. St. Tekawitha is the patron said of ecology and the environment.